Our BS/BSA Series devices provide very precise and ultra stable DC voltages up to +/-14V. 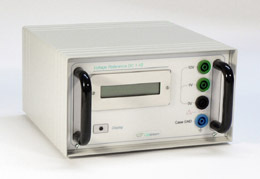 Unlike DC power supplies, the outputs are optimized for high stability and low noise. A short response time (~millisec.) allows for fast and precise Qubit manipulation in Quantum Computing. The devices are housed in standard 19-inch cases and controlled by USB connection. The programmed voltages and measured output currents are displayed on the front LCD display. Left: UM 1-5/1-14 LN: latest family member of our series of 3-channel ultra high precision voltage sources. in the g-factor proton experiment. The HV 500-16 is a bipolar multichannel high voltage source with continuous zero crossing designed for ion optics and beam lines. HV-FEP device especially for field-emission electron sources available. in the g-factor calcium experiment.